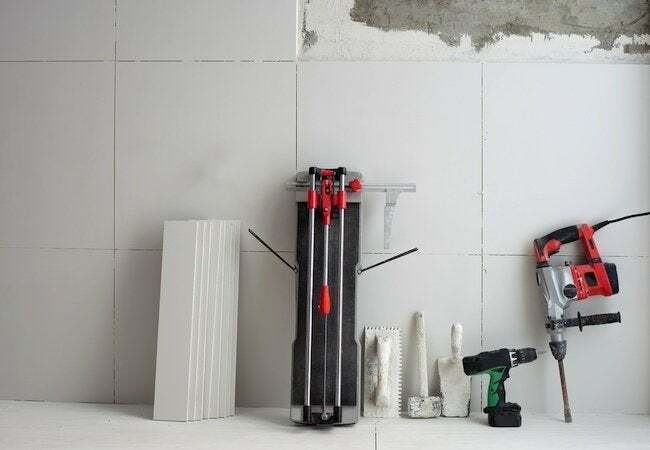 So long as you've got a power drill and the right assortments of bits, drilling through tile is a task every average homeowner can handle. Read on to learn how it's done. Planning to install a new towel rack or grab bar in your bathroom? That may mean drilling through ceramic tile. It’s not a difficult job, but you do need to go about it the right way. Start by using tape to make an X over the spot where you want to drill. The tape will protect the surrounding tile and also help keep your drill bit from wandering. Insert a carbide-tipped tile bit into the chuck of your drill and tighten it up. Dip the bit into cutting oil, then wipe off the excess. Position your bit on your mark and using light pressure, drill through the tape and into the tile (be careful not to push too hard; that could crack the tile). Once you feel the bit exit the inner side of the tile, remove it gently. If your tile’s mounted on drywall, switch to a drywall bit and finish the job, again withdrawing the bit carefully. Insert a screw anchor into the hole and mount your towel rack or grab bar.